IMPORTANT: To have access to a Slider section instead of the Big title section, please install and activate our companion plugin from here . Here you can add a background image, title, subtitle, and button. By default, your Big title section is visible. You can check the Hide big title section button and the big title will disappear from your homepage. Add a banner – For each banner, you can add an image and a button link. You can add as many banners as you want. By default, your Banners section is visible. You can check the Hide banners section button and the banners will disappear from your homepage. For this section to work, you need to install and activate the WooCommerce plugin. This will automatically display the WooCommerce latest products. You can either enter a WooCommerce shortcode, or select a category of products to display. By default, your Products section is visible. You can check the Hide products section button and the section will disappear from your homepage. 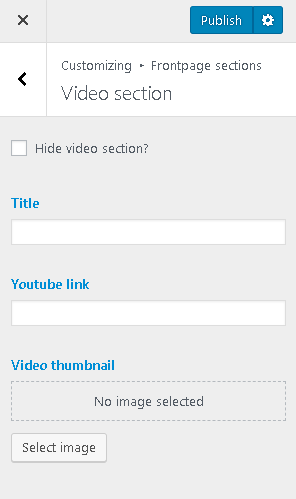 Add a title for your video and embed the video from YouTube. A short video about your products would be probably the best way to promote them. You can also place a thumbnail image for your video. By default, your Video section is visible. You can check the Hide video section button and the video section will disappear from your homepage. For this section to work, you need to install and activate the WooCommerce plugin. This section is placed immediately below the Video section. By default, WooCommerce products from the first category found are displayed in this section. You have the option to choose a different category, to add a title and a subtitle. The footer section includes the copyright and the social icons where you can add all your social accounts. The theme supports almost all social networks available. 404 Page settings allow you to edit the title and the content for the Not found page. The best part is the Background Image for 404 Page and the “Back to” button. Never lose again your visitors from that page. Add a new image – by clicking the “Select Image” button. Add new Menu – ShopIsle theme supports 1 menu. Select which menu you would like to use. You can edit your menu content on the Menus screen in the Appearance section. Shop Isle works with translation plugins like Loco Translate. How to translate Shop Isle with Loco Translate. IMPORTANT: To have access to the About us template in Shop Isle, please install and activate our companion plugin from here.